So, in my meanderings today I took some snaps of the veggies and the system. We have lots and lots of growth on the tomatoes. All of the varieties are doing well, but of particular note is the cherry variety—a yellow one that we planted in a bed (as opposed to a pot) has at least 12 beautiful bunches of tiny green jewels, coming along nicely—soon to ripen in the sunshine. 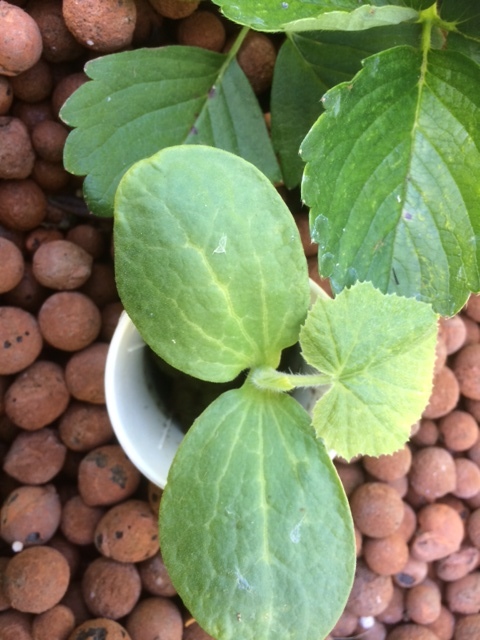 The other stand-outs in the soil garden are the potatoes (all doing rather nicely with wonderful vigorous growth) while in the aquaponics system it’s the strawberries, and the ever green (and I mean ever green, and bushy and prolific!) parsley. My other little treasure is the one and only spaghetti squash plantlet that I managed to germinate from seed. It has got past its two-leaf phase and is now sporting a rather dapper fuzzy leaf out of its crown (happy sigh). Tags: fresh food, gardening, potatoes, spaghetti squash, strawberries, tomatoes, vegetables. Bookmark the permalink. I am glad to hear from you again. It is nice to catch up and see how you are doing. I am glad that you took a break, because you sounded stressed and over worked before. Your scheduled sounded impossible to maintain for anyone. You sound more relaxed and centered. The garden looks great as always. Hey, lovely to hear from you Honey! I guess I was a bit overstretched…it’s studying sustainability that is both energising and confronting at the same time. I am back at University now and a lot of stuff to study and read; and I have a trip to New York at the end of August planned…so I guess the busy-ness just doesn’t end. But it’s good to be busy and engaged!